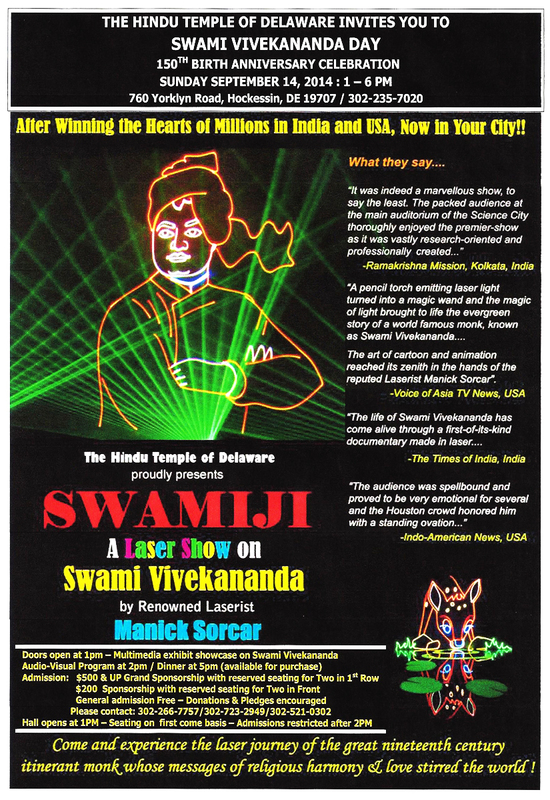 A poster used for Swamiji laser show and the event at Hockessin, Delaware. Click for an enlarged view. The Hindu Temple of Delaware, 760 Yorklyn Road, Hockessin, DE 19707. Hockessin is a part of the greater Wilmington. The hour-long laser show is a part of the "Swami Vivekananda Day", a day-long celebration of the 150th birth anniversary of the itinerant monk by the Hindu Temple Association, starting at 1 pm in the afternoon, ending in the evening at 6 pm, after refreshments. Stay tuned for more info as they come along.
" The devotional fervour and technological expertise with which Mr. Sorcar has captured the life and message of Swami Vivekananda is simply marvelous! It is a unique experience for anybody to get glued to the laser show for one hour which unveils the life and message of Swami Vivekananda and get transported into an entirely different world”.